Pu'u Poa Beach (also spelled Puu Poa) is on the northeast edge of Hanalei Bay, running northeast from the mouth of the Hanalei River and ending in front of Hanalei Bay Resort and the Princeville St. Regis Hotel. This reef protected, golden sand beach is the longest in the Princeville area - quite wide in front of the hotel and narrower near the river. Large trees behind it provide shade for all but a few hours of the day. The beach faces directly west toward Bali Hai making it ideal for enjoying those picture perfect post card sunsets. Golden sand, the Hanalei Mountains, Distant Waterfalls, Bali Hai, and Hanalei Bay make this beach one of the most picturesque places to be found anywhere. The beach is a popular spot for weddings and is often used for movie locations - most recently, The Descendants, with George Clooney. Snorkeling at Pu'u Poa Beach: The reef that protects the beach from wave action also provides a nice habitat for lots of different types of fish and the occasional turtle. Except for a narrow sand bottom channel that runs out to deeper water, the reef extends just under the surface across the entire length of the beach. Swimming and snorkeling on top of the reef is possible during normal to high tides, but as the tide goes out, it becomes too shallow for swimming. During winter swells when the surf comes up over the reef, swimming and snorkeling here is not advised. There is no lifeguard at this beach. Ancient Hawaiian Fish Pond: Directly behind Pu'u Poa Beach was an ancient pre-historic fish pond known as Kamo'omaika'i. To construct it, early Hawaiians built a rock wall barrier from ridge to ridge across what was once a small bay. Small fish would have been able to enter the bay between the rocks and then become trapped inside as they grew, providing a ready supply of fish. Although this design worked well in other parts of Hawaii, such as the Menehune Fishpond near Nawiliwili, it didn't last long here. The pond quickly filled up with sediment, filling in the bay and becoming a marsh. Some parts of this rock wall are still visible just behind the beach. Much more is buried below the sand. Directions to Pu'u Poa Beach: If you're a guest at Hanalei Bay Resort, just take the steep but paved beach path that goes under a green jungle canopy down to the beach. It's a 5-10 minute walk from the resort. The resort will also shuttle you back and forth in golf carts if you'd rather not walk. If you're a guest at the Princeville St. Regis Hotel, just take the elevator from the hotel down to the beach. If you're not a guest at either of these resorts, you can also use the public access path/stairs just to the left of the hotel. This works well if staying somewhere in Princeville but difficult with a car because public parking spaces are hard to find. A small public lot exists between the hotel and Pu'u Poa Condos, but it is nearly always full. If none of these options work for you, you can always just swim or wade (it helps to be 7 feet tall) across the mouth of the Hanalei River north of the pier. Nearby Vacation rentals include Hanalei Bay Resort, Puu Poa Condos, Pali Ke Kua Condos, and many more located in Princeville. 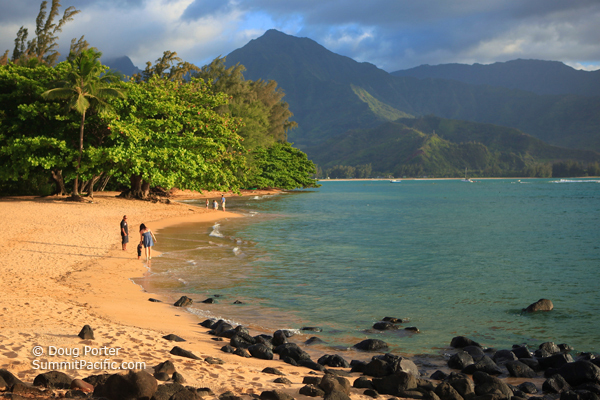 Click for more must see Kauai Beaches.